VaiKai supports cognitive and emotional development through connected play. She communicates gently with adorable sounds and breathing color light. When held in hands, VaiKai responds to motions and you can feel a heart beating in the wooden body! You can easily set up alarm clock and timer via bluetooth connected VaiKai App. Whether you learn to control your screen-time, concentrate on musical instrument practice, or wake up in the morning - now it becomes a playful ritual. 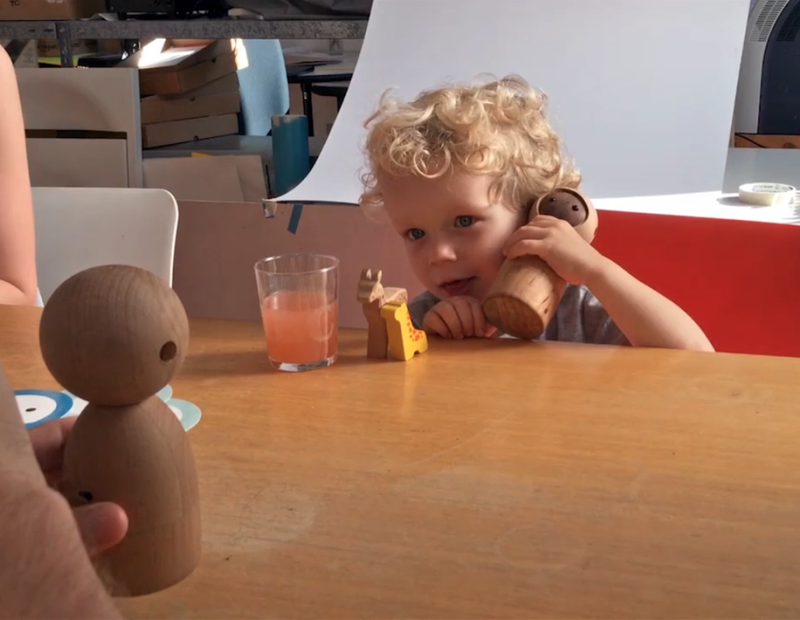 Animated VaiKai dolls are inspired by the natural way children use their toys. Sounds of excitement while flying, giggles while dancing, snores while being put down to bed, pumping heartbeats felt beneath the wooden body, spark imagination, give opportunity to invent some hide&seek stories, treasure hunt adventures, and many more unforgettable childhood memories. "Because the dolls are so simple, there’s no limit to how they can be used. " Together with Early Childhood and Development Specialists from Sheffield University we studied the effects of playing with screen-less digital VaiKai dolls, known back then as Avakai, on the 4-6 year olds. We have discovered that the interactions of the dolls were triggering unique narrative and care-taking play patterns, that are essential for the emotional and cognitive development at the early age. "It is a radical different approach to connected products"
Our Chief Designer Obsessed with details. As soon as you hold VaiKai Doll in your hands you will immediately recognize how much love we put into making them. Every doll we produce, is carefully turned, polished, hand-finished and painted using the highest quality ecological and child-friendly colors by the Swiss company Zuelch™. We work together with local manufacturers throughout Europe that have known their craft for generations. It´s a combination of precise handcraft and technology. When all the components arrive to our workshop in Berlin, we assemble and test every piece. We think of our planet when producing. That’s why we only use wood that comes from sustainably managed forests within the EU to also give future generations woods to play in, fresh air and innovative toys. It takes more than 30 years for a beech tree to grow big enough to be used in turning. When selected and cut by the foresters, the tree has to mature and dry for another 4 years. Only then, it arrives to our workshops ready to be turned. When our dolls reach your home it is a result of almost 40 years of creation that started once as a tiny seed. We believe that if we take from the forest we have to give something back - for every tree we use to make our dolls, we plant 5 new trees. They will grow together like the kids playing with the Vai Kai dolls. Since 2016, hundreds of families around the world have hosted VaiKai Dolls at their homes. Parents caring for the healthy digital environment, have found VaiKai as a perfect gift for their kid's early childhood. We respect your privacy. We don't spam. We don’t share your data.